Louise Edwards, ND, LAc, hails from a generation that began a "back to earth" movement. "In the 1960s, the 'hippie generation' explored whole foods, ecology, herbal medicine, and alternative lifestyles. It was very progressive," she explains. 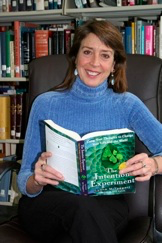 Deciding she wanted to help transform adverse influences in ecology that resulted in adverse effects on human health, she realized that the field of natural medicine would allow her to do both. After graduating with degrees in both oriental medicine and naturopathic medicine, Dr. Edwards chose to live and practice in Colorado. "Another part of why I chose to become an ND is that I wanted a means to earn a living in a small mountain town. Naturopathic medicine allows me the ability to earn a living almost anywhere in the world without having to rely on industrial resources. Naturopathic medicine is really the people's medicine, partly because it's a low­tech medicine." "I love practicing in a rural area. I have a genuine family practice seeing generations of people." Her files boast 6,000 charts in a town of 15,000 people. "Of course I'm drawing from a much larger rural population. Since I'm the only ND in a large area, people travel quite a distance to see me." "I teach my patients that re­establishing the basis for health means looking at some of the simplest things: breathing and the quality of the air we breath, hydration and the quality of the water we drink, nutrition and the quality of the food we eat. By educating my patients on these determining health factors, I can secondarily motivate them to get engaged in doing things to help transform the environment. Dr. Edwards joined the naturopathic profession during the beginning of its historic renaissance. In 1988, she took the very first NPLEX exams. She was present at the first meeting of the American Association of Naturopathic Physicians and served on the board during the mid­'90s as a legislative chair when very few states had licensure laws for naturopathic physicians. Dr. Edwards was also a part of a team involved in political efforts that resulted in a big jump in the number of licensed states in the '90s. At National University of Health Sciences, she shares several courses with other instructors. "I teach two courses on naturopathic philosophy and principles. We also teach a course that takes what students are learning in physiology, anatomy and biochemistry and shows them exactly how it affects health, like how hydration affects the cell or how air is utilized by bodily systems. I also teach an 'Introduction to Oriental Medicine' course and two courses in advanced and applied clinical theory." She also guest lectures in practice management, clinical nutrition, counseling, and offers in­service teachings on special topics in the NUHS Whole Health Center.